Disclaimer – I was given ProYo to sample . I was compensated in the form of product coupons (will work for frozen yogurt, peeps!). All opinions are my own! 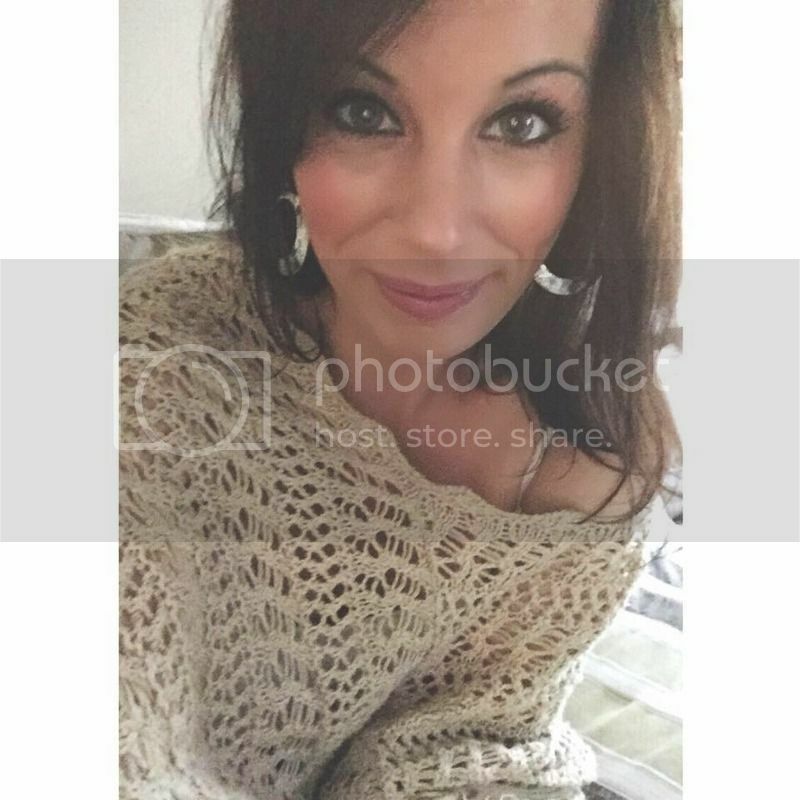 I have a fun and exciting post for you guys today! 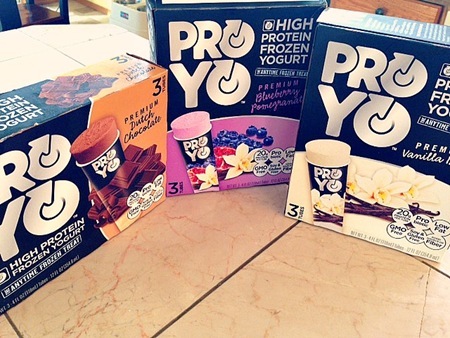 First – Have you heard of ProYo before? 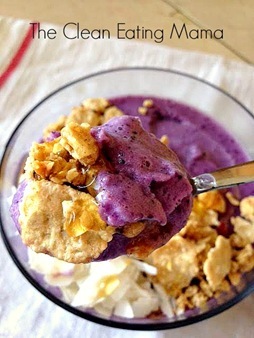 ProYo is a frozen yogurt treat that is packed full of protein and good for you! I am a HUGE frozen yogurt fan and these do not disappoint! So here is the ProYo Promise! Each ProYo is crafted from creamy high-protein probiotic yogurt and all-natural ingredients to create a delicious and nutritious “anytime frozen treat” loaded with 20 grams of protein. Enjoy the convenience and health benefits of ProYo anytime… as breakfast on the go, a pre or post-workout boost, a base for a smoothie, a distinctive dessert, or a late-night treat. At ProYo, we are committed to providing a unique blend of taste and nutrition to enhance and promote a healthy and rewarding lifestyle. 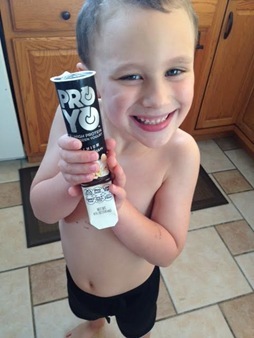 ProYo contains no artificial preservatives, colors, or flavors and is ideal for people of all ages. They have 4 flavors – vanilla, vanilla banana, chocolate and blueberry pomegranate. I picked up the vanilla, chocolate and blueberry pomegranate – they didn’t have the vanilla banana at the store where I picked these up at. ( Check to see where you can buy them!) Jordan wanted to try the vanilla flavor as soon as we got home – he was an instant fan! I feel really good about giving him these little ProTreats, too! INGREDIENTS: Skim Milk (Cultured with the following live active cultures: Bifidobacterium lactis, Lactobacillus acidophilus, Lactobacillus bulgaricus, Lactobacillus lactis, Streptococcus thermophilus), Whole Milk, Whey Protein Concentrate, Sugar, Organic Inulin, Natural Flavors including Vanilla Extract, Dextrose, Ground Vanilla Beans, Stevia Extract. Contains the following allergens: Milk. This product is processed in a facility that also processes eggs, peanuts, soy and wheat. I am going to use them as part of my smoothie base – they make an excellent substitution for protein powder! Blend all of the ingredients together. Pour into a bowl and place in the freezer for an hour or so. 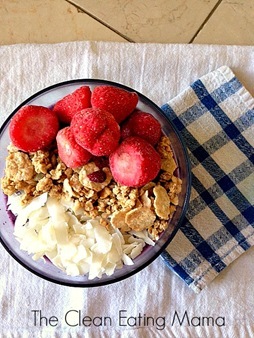 Top with coconut strips, granola, more fruit and some honey! 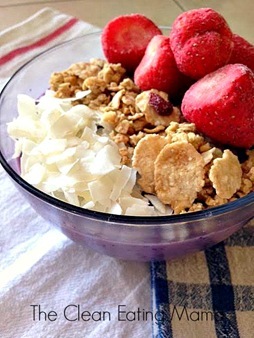 This entry was posted in give away, recipe, yogurt. Bookmark the permalink. This is pretty important to me as my wife Linda is allergic to quite a few things like gluten, wheat, soy, eggs, dairy and corn. First thanks for making sure there are Nutrition facts like this and the facility warning are included with your recipes and product reviews. Contains the following allergens: Milk. This product is processed in a facility that also processes eggs, peanuts, soy and wheat. You may want to try things made with goat milk (she can eat that because the protein is a smaller size and she can digest it. Also gluten-free doesn’t mean “no taste” as the Flying Apron products can show (aa http://www.flyingapron.com/) – plus it’s local. Last be aware that there are products that will say they are Gluten-free but will then say “This product is processed in a facility that also processes eggs, peanuts, soy and wheat” which in a nice way of saying they are not really gluten-free. We found this out the hard way early when our gluten intolerance knowledge was pretty slim – a Tiger bar that we purchased at Trader Joes that said it was gluten free put her in the hospital with symptoms that mimicked a heart attack (it can be very serious). BTW there is a certification manufacturers can get that anoints them as truly gluten-free. Be on the lookout for that. Thanks for the great recipes and food facts.